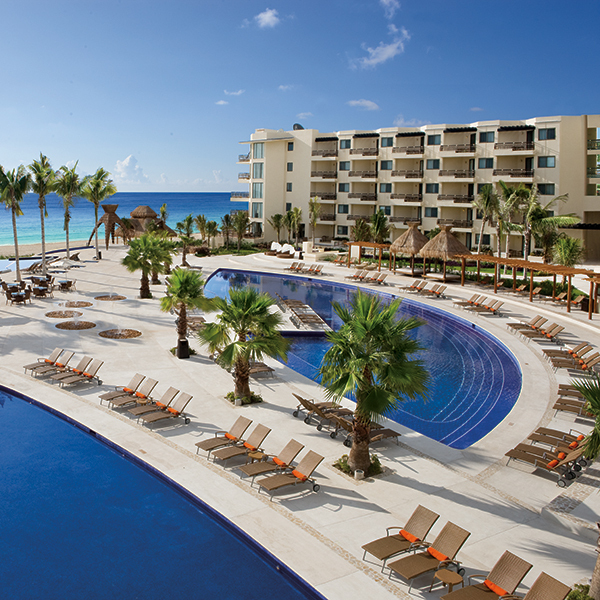 Orlando, Florida – March 27, 2015 – (INTUITION by Perspective Group) – Unlimited Vacation Club (UVC) by AMResorts today announced its Dreams Riviera Cancun Resort & Spa was named the global timeshare industry’s Best Timeshare Resort in Latin America at the 2015 Perspective Magazine Awards celebration. The Perspective Magazine Awards program, now in its fifth year, presents one of the timeshare industry’s highest honors. The accolade recognizes the industry’s best and brightest as determined by a panel of four judges and a public online vote. This year’s winners were announced before an audience of senior executives from around the world during an awards gala at the Fifth Annual GNEX Timeshare Leader’s Conference in San Diego, Calif.
Dreams Riviera Cancun offers members all the benefits of AMResorts’ Unlimited-Luxury® vacation concept, in which everything is included: 24-hour room and concierge services, limitless access to gourmet dining with no reservations required, unlimited top-shelf spirits at bars and lounges, pool and beach wait service, twice-daily maid service, a daily refreshed mini-bar, daily activities, nightly entertainment and more. Forming a horseshoe-shaped enclave just off the Caribbean Sea, Dreams Riviera Cancun brings a soothing ambiance to its prime location on the Riviera Maya, just 15 minutes from Cancun International Airport. Set on a swath of white-sand beachfront, this AAA Four-Diamond resort offers a fun and luxurious escape for couples and couples with children. The property houses 486 octagonal-shaped guest rooms and suites, just steps away from the sand. Rooms are elegantly appointed with private patios or balconies, gauzy white curtains, and full marble bathrooms with whirlpool tubs. Select ground floor accommodations also feature plunge pools. Adding to the comforts are: complimentary Wi-Fi and app-to-app calling through the Unlimited Connectivity program, a mini-bar refreshed daily, and 24-hour room service for resort-style dining without having to leave your room. While couples find Dreams Riviera Cancun the perfect escape, families are equally charmed by the resort’s pristine beach with calm waters and fun-filled, Mayan-themed Explorer’s Club. Children, ages 3-12, delight in the Club’s pyramid-shaped climbing wall, splash fountain, playground, indoor game room, theatre, big-screen movies and scores of activities. When young guests are having a good time at the Explorer’s Club, adults can duck into the full-service Dreams Spa by Pevonia, featuring a full menu of therapies, treatments and massages. Dreams Riviera Cancun is also home to nine gourmet-dining options, including six à la carte restaurants featuring delicious dishes from around the globe. Feast on everything from fresh local seafood to authentic Mexican, fine French, Italian and Pan-Asian cuisine. Six festive bars and lounges add to the mix. Whether guests choose a high-energy, cozy or swim-up bar, they enjoy unlimited top-shelf spirits, beer and fine wines. Adding to the options, guests also can take advantage of the UVC Sip, Savor & See program, good for drinks, dining and entertainment at nearby participating resorts. With its myriad options and VIP concierge service, Dreams Riviera Cancun invites UVC members to craft an experience to suit their personal taste. There are onsite water sports, dance lessons, yoga, windsurfing, bike rentals, beach volleyball and more. When the sun goes down, an array of nightly entertainment – themed parties, big screen movies, live shows at the outdoor theater and more – assure there is always something new to try. Not far away, UVC members receive complimentary greens fees at the Grand Coral Riviera Maya Golf Course. Also nearby are exciting tours and excursions, including scuba diving, deep-sea fishing, swimming with dolphins and archeological site tours. For more information about Dreams Riviera Cancun and UVC please visit http://www.unlimitedvacationclub.com/Resorts/Dreams/DreamsRivieraCancunResortSpa. Unlimited Vacation Club by AMResorts is an exclusive travel club providing VIP privileges at luxurious AMResorts properties throughout Mexico, the Caribbean and Costa Rica. Through different participation levels — Pearl, Silver, Gold, Platinum and Diamond — members can enjoy preferred rates, free nights and access to exclusive partner offers. AMResorts brands offer a variety of upscale travel experiences, from romantic, adults-only destination resorts to wellness retreats and family-friendly properties.